Optimum Wait Time Before Slicing? I've heard it said that the flavor of artisan type loaves is improved by letting them sit quite a long time before slicing. Some even say you shouldn't cut them until the next day. Can anyone comment on the optimum wait time before slicing? Particularly, I'm interested in naturally leavened sourdough boules . 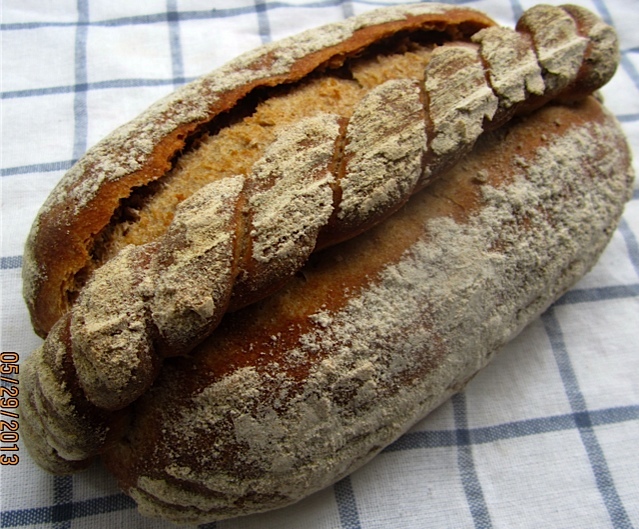 We do wait until the next day before cutting lean sourdough loaves and ryes, and it does make a difference especially in the mouthfeel of the crumb and rye flavor intensifies. But neither of us has enough self-discipline to not cut into--and devour--a still warm baguette. Actually, we freeze baguettes immediately after they reach room temperature, then thaw them as needed, refresh them in a 375°F oven for 5 minutes and cut them still warm. So I guess I have to say we prefer baguettes slightly oven-warm. Absolutely gets better a day after if you can wait. I wouldn't dream of waiting to cut into a freshly baked bread. No matter which kind of bread! A regular sized loaf can't be consumed within one day by us two people anyway, and the longer you wait, the less crusty and drier it gets. I love the taste and feel of bread that is baked the same day, so why would I deny myself that pleasure? You can have the rest of the bread ( with the supposedly superior taste - a claim I can't confirm) over the next days, anyway. Am I crazy not to have a slice of this when it's still a bit warm from the oven? With Irish butter! No, those are the exeptions, Varda, there I wait until they are completely cooled, and have some in the evening, when I baked them in the morning.